PLYMOUTH — Boom goes the dynamite! 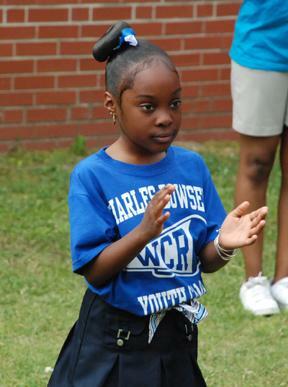 The cheerleaders at this year’s 2009 Charles Bowser NFL Youth Football/Cheerleading Camp certainly were explosive. Working in unison, the young cheerleaders put together a wonderful halftime routine during a flag football game that capped this weekend’s camp. Miami Dolphins cheerleaders were on hand this weekend to interact with the girls. Kim Leary, the camp’s cheerleading coach, was thrilled about the outcome. Amy M. and Kellie C., a pair of Miami Dolphins cheerleaders, were on hand to lend their support. “This has been amazing,” said Kellie, a rookie on the Miami cheerleading squad. “The kids are so great. They’re eager to learn. Amy, a second-year cheerleader with the Dolphins, was glad she had the chance to mingle with and teach the campers. The campers were happy they had a chance to spend some time around professional cheerleaders. Tiffany Palin, 13, enjoyed learning new routines from the Dolphins cheerleaders. The campers returned the favor to the Dolphins cheerleaders. Campers were from Creswell High School, Creswell Elementary, Pines Elementary and Washington County Union. Participants ranged from first grade to tenth grade. “It’s an exciting time to have all the schools come together and have a wonderful time,” said Leary, who thanked coaches Shirley Henson and LaTasha McNair for their help. “It’s all about learning to work together, and learning how to make friends. There were certainly plenty of reasons to cheer.